While a lot of herbs are great for chickens, there’s a few that I feel are the best herbs for chickens to eat. Yes, I want to SPOIL my hens with nesting herbs! There’s also a couple on my list that are perfect for other uses, such as first aid and as natural cleaners (make sure you grab my free reference sheet). In this episode of What The Cluck?! we look at my favorite herbs for chickens to eat, as well as how to actually incorporate these herbs into your daily life with your flock. 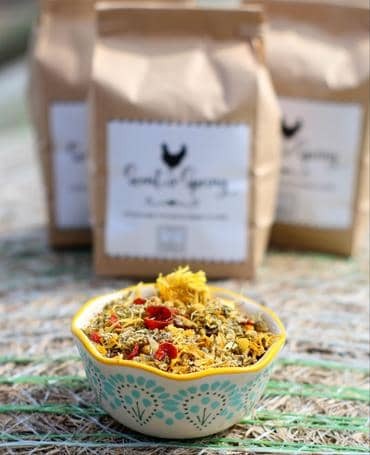 So, first let’s talk about the whys, meaning why bother being concerned about the best herbs for chickens to eat, as well as using herbs in the first place, and there’s some good reasons, as well as scientific reasons, why herbs are a good idea. When it comes to chickens and their eggs, withdrawal times is a big deal, more so than with dogs and cats, for example. And this is for obvious reasons, we eat eggs and we eat chicken, and many modern medicines will come out in their eggs and meat, we know this for a fact, so unless you want a mouthful of antibiotics, which I don’t think any doctor out there would recommend unless you’re sick, then withdrawal times play a really important role when making decisions for your flock. Herbs, on the other hand, don’t have withdrawal times, so the advantage in certain situations is pretty clear. As an aside, if you end up raising goats for their milk, for example, you can avoid wasting milk if you’re able to treat them with herbal remedies since medicines can come out in their milk. But getting back to chickens, you can also use herbs to promote better laying and to get your hens to lay in their nests, if they don’t already do that. I do get questions frequently from readers and listeners whose hens won’t lay in nests, and there herbs I do recommend for that. 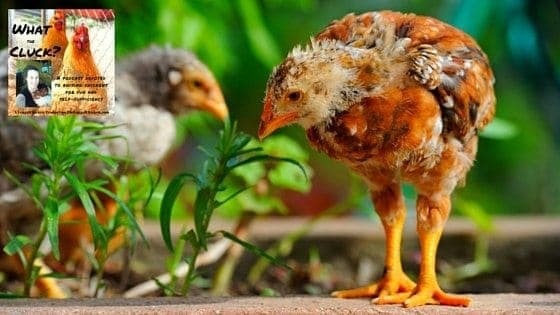 So, lets get into the best herbs for chickens to eat and how to use them! So we’re going to start off with my favorite herb to use in my coop, and that’s oregano. Oregano is one of the best herbs for chickens to eat and there’s a couple reasons for that. Oregano is well-known for its antibacterial properties, and it’s becoming the darling of the egg industry because studies are showing that it’s more potent than antibiotics for keeping chickens healthy. And these are large farms with hundreds of thousands of chickens, so disease tends to run rampant at those places just because of living conditions and overpopulation. But these farms in New York State found that when they fed oregano, that their death rates and illness rates declined quite extensively. And I’ll put a link in the show notes where you can read an article from the New York Times about it. So, the way I like to offer oregano is dried or fresh in bunches, and the nice thing about this is that the chickens can peck at it, and it keeps them busy and not forming negative behaviors in addition to keeping them healthy. Another great thing to do with oregano is to use it in their nesting boxes, and you can do this by just putting fresh leaves into the boxes themselves. The hens will love the scent and it will help deter pathogens. Another nice thing is it will help keep the eggs clean because your hens will have a clean place to nest, and the scent will give them a boost and stimulate egg laying. At the end of the day, happy hens lay better and if they have healthy food in their systems, like oregano, their eggs will be healthier, so offering them a nesting box with oregano leaves will help them lay better eggs. So, like I said, oregano is really one of the best herbs for chickens to eat. While lavender has some antibacterial properties, and it is one of the best herbs for chickens to eat, it’s better known and better used as a calming agent. So, lavender is well known to be a way to calm people and animals, and that means chickens too. I like to use lavender in nesting boxes to help create a peaceful environment for chickens to lay in. While it doesn’t outright promote laying, meaning you can’t feed a hen lavender and out pops an egg, you can create an environment that promotes calmness that will help your hen feel secure enough to lay. Laying eggs is one of the most vulnerable times for a hen because she needs to stay still, and since hens are a prey animal, in the wild, not moving could mean death. So, a hen that’s stressed or worried is not likely to lay, or at the minimum, she won’t lay a good, healthy egg. So offering an environment that lets her feel safe is a great way to encourage her to lay, and if she feels secure, she’ll lay better eggs, assuming you’re also feeding her an adequate diet. 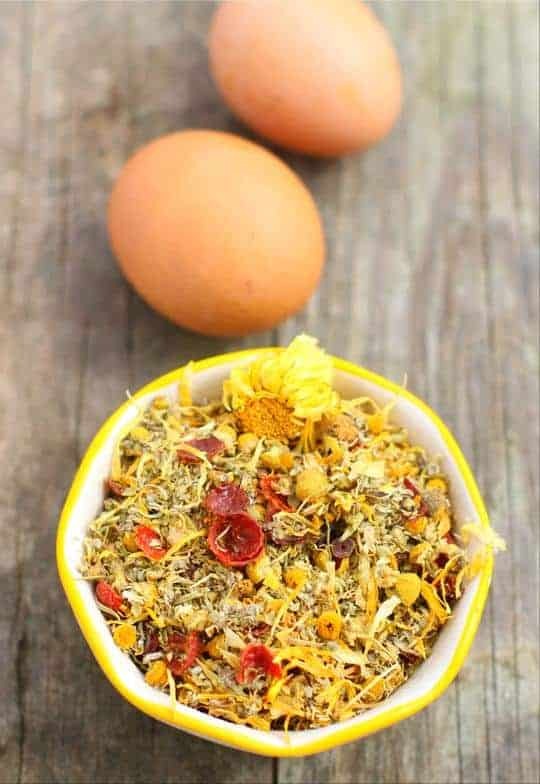 You can incorporate it into their feed as well, either fresh or dry, and like I said, it is one of the best herbs for chickens to eat because it does have antibacterial properties, so your hens will derive some benefit from it that way too. You can also add lavender to cleaners to give them a calming scent your hens will appreciate. Now when it comes to using herbs in your chicken’s nesting boxes, be sure to change them frequently so they don’t mold or breed other pathogens, especially if you use fresh herbs. Switching them out every other day or so will work well. 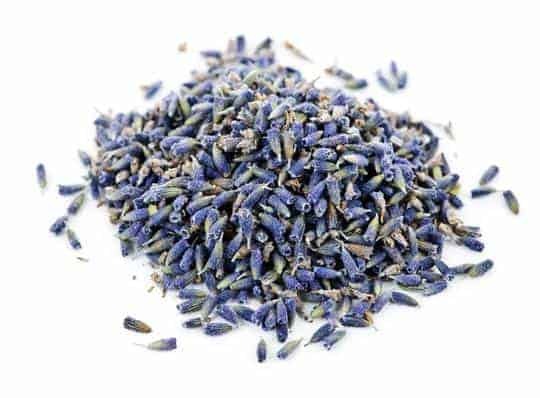 The other thing about lavender is it repels insects, and I’ve found it useful against flies, so including it in your nesting box will help repel flies, which of course, spread disease. Mint is extraordinarily useful for many things when it comes to your chickens and I always keep a ton of it around the homestead. I like to use peppermint for a lot of things, and so that’s what I mostly grow, and it’s one of best herbs for chickens to eat. Mint is great to put in nesting boxes along with lavender to stimulate laying, and it will create a fresh, good smelling environment for your chickens. But what I really like using mint for is as a repellent. On our farm, because we have so many animals, we have a lot of flies, and I can tell you that mint is great for repelling flies. I have a natural fly repellent I made here on the farm, and it works great. You can read the exact recipe to make it on the blog, but to recap, you boil the herbs, I like to use both mint and lavender since both repel flies, and allow them to steep in the boiling water, just as if you were making a tea. You then mix it with witch hazel to formulate your fly repellent. The witch hazel does have a bit of a scent, but because water is absorbed really quickly into things while witch hazel isn’t, it works better for ensuring the lavender and mint stick around longer. Once you make the repellent, you’ll have herbs left over, and you can feed them to your chickens for an additional immune booster. 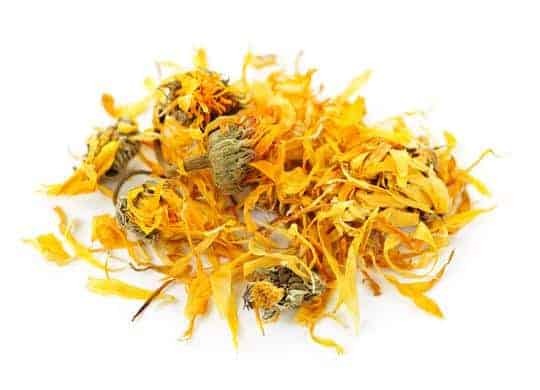 So next on our list of the best herbs for chickens to eat is calendula, and there’s a good reason for that. Calendula have long been known to repel insects in gardens, and they’re considered to be one of the best companion plants out there. So, using them in your chicken coop, in nesting boxes, for example, will help repel bugs and keep them out of your nesting boxes. Calendula is also edible for both people and chickens, and they’re said to make your chicken’s egg yolks more orange, so if you want, you can offer the petals to your chickens in their feed. Now, if you want to do something fun and entertaining, you can grow the best herbs for chickens to eat in a grow box, which is a raised bed, 4 to 6 inches high is a good height, that also has a top made of hardware cloth. So, as the herbs grow, they reach the top of the hardware cloth. Chickens can peck the herbs above the hardware cloth or a little below it, but they can’t get to the roots of the herbs, so once the tops of the plant is gone, it has the ability to grow back. 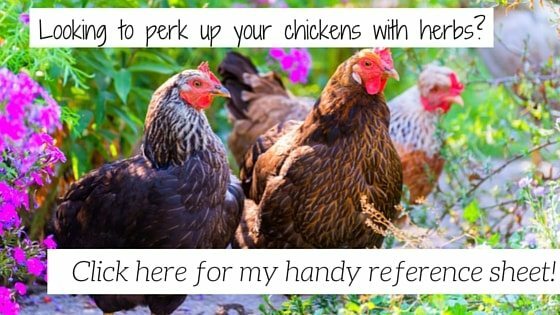 It’s a great way to offer herbs to your chickens in a way that’s also interesting to them. You can either grow the herbs straight in the ground or make the grow box like a container garden for them. Now, if you’re interested in giving your hens herbs and want a handy reference sheet, you can grab my free tip sheet on the blog at TheFrugalChicken.com/chickenherbs. The best herbs for chickens to eat are also great for other uses (like first aid), Find out how to use them to raise happy hens (and healthy eggs)! Hi Maat, thanks for the information, how do you find your information? I’d also like to know which breed of chickens you keep and why. Hi Suzie. I find my information by reading studies. I keep all kinds of breeds. My favorite laying breed is Production Reds and I keep Blue Copper Marans because I think they’re pretty. Hope this helps!